Folic acid and vitamin B12 are both B vitamins which help convert carbohydrates to energy in your body. They also help your body metabolize fats and protein. Folic acid is found in foods like green leafy vegetables and beans. Unlike folic acid, B12 is found in dairy products, fish and eggs. Both vitamins are available in supplement form and should be taken under the supervision of a health care provider due to possible side effects and interactions with medications. High doses of folic acid can mask vitamin B12 deficiency, leading to neurological damage, as stated by UMM. Both folic acid and B12 are usually taken together or as a B complex vitamin to prevent this side effect. Before taking a higher than recommended dosage of folic acid, check with your health care professional to make sure you do not have a deficiency in vitamin B12. The National Institutes for Health (NIH) states that vitamin B12 causes severe allergic reactions in some people when taken by mouth or as a prescription injectable. Folic acid can also cause allergic reaction like hives, difficulty breathing, or swelling in your face, lips, throat or tongue, according to the University of California at San Diego (UCSD). Vitamin B12 can cause mild gastrointestinal issues or stomach problems in some people. To avoid an upset stomach, the Brainpower.org website states that you should take B12 with food. 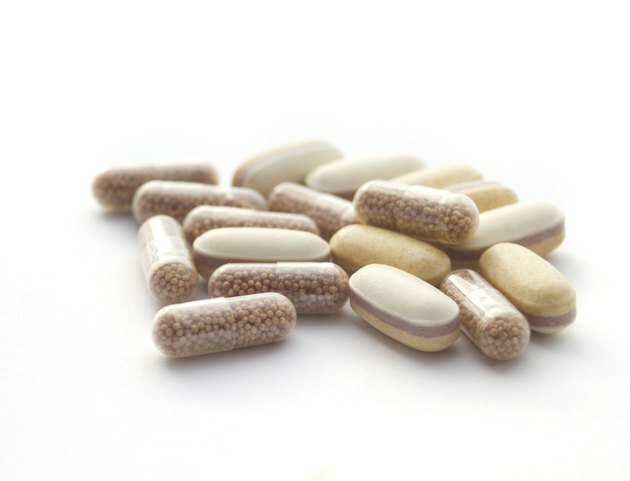 When folic acid is taken at the recommended daily allowance, side effects rarely occur. However, when taken in high does folic acid can cause sleep problems in some people, according to UMM. Sudden onset of sleep disturbances or insomnia may be attributed to taking more than the recommended daily allowance of folic acid. In rare instances, folic acid can cause skin reactions and even seizures. Additional side effects of vitamin B12 include diarrhea, skin itching and blood clots. Because B vitamins are water soluble and the body does not store them, side effects are less likely to occur. If you experience any side effects related to folic acid or B12, contact your health care professional immediately.